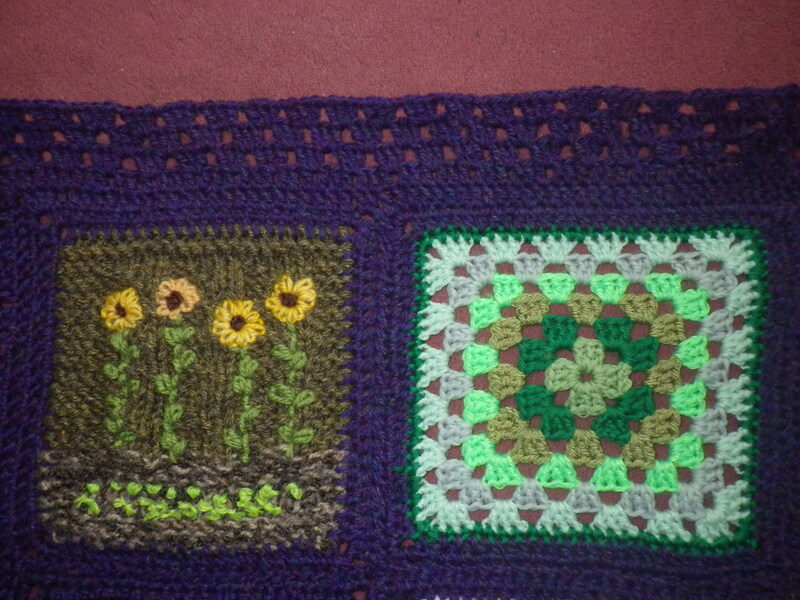 Finally the blanket from the scraps left over from Sophie is finished (originally featured in ScrapHappy September). Actually, it also includes some other scraps and a few new balls just to get it up to size, along with some of the abundant Cambrian Mountains wool that I had squirreled away and which was perfect to frame the blanket. 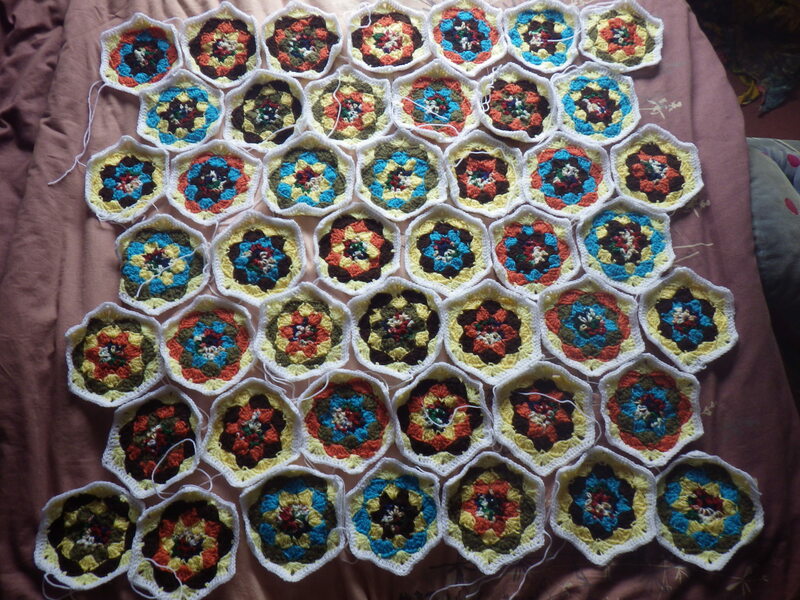 The pattern suggested just joining the hexagons at the corners, and this is what I originally did, But I wasn’t happy with how loose this made the blanket, so I have crocheted each row of hexagons together, leaving only the adjacent hexagons in each row unattached. This gives it more strength and means it’s less likely to get accidentally damaged because of something getting caught through one of the many gaps. There were about a million ends to weave in, but I have plans for all the little left-over bits… watch this space. And now it’s off to Reading to make Mr Snail’s flat feel a bit more like home and provide a virtual hug from me when he’s there all on his own. I bought new wool to make her, but there was rather a lot left over: perfect for a ScrapHappy project. So, with Mr Snail living away from home during the week (more on that in a future post) and him commenting that the flat he’s renting doesn’t entirely feel like home, I decided that a snuggly sofa blanket was needed. It’s not finished yet, but this is progress so far. As well as the left-overs from Sophie there are a few balls from my stash. It’s all wool (with the exception of a tiny bit of silk in on blend) and almost all British; any that isn’t is old balls that I have no idea anymore of the origin. 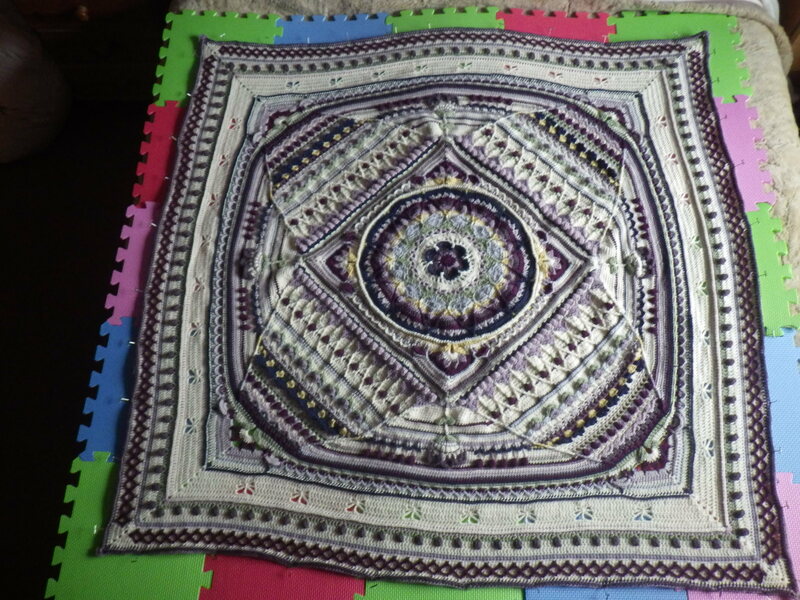 I’m planning to work on it until I have used up as much of the wool as possible and then edge it in the cream wool (Cambrian Mountains), of which I have quite a lot left on the cone I bought to make Sophie. I think it will make Mr Snail’s flat feel a bit more like home and keep him warm on those cold winter nights… if I can just get it finished! Don’t worry, I haven’t disappeared completely, it’s just a really busy time of the year. We have been away for a couple of days celebrating my mum’s 80th birthday. She was taken ill on her birthday last year and since then has been diagnosed with two very serious illnesses and lost my dad. Now that she’s recovering somewhat, it seemed like a good time to celebrate and so we did. Let’s hope the coming year is less sad and stressful than the last one. And I’m back at work on edging the masterpiece. I’ve now done five complete rounds and I plan to do one more in blueberry, one in black and then the final wavy edge… unless I change my mind!! At the end of the week I’m going back to Karuna to teach my annual introduction to permaculture course, so I will have to find something small to make whilst I’m away… socks? string bag? granny squares? a dish cloth? Who knows? If you don’t hear much from me over the next few days, don’t worry, I will be back for sure on Monday 28 July… I know this because I’m already working on the post! 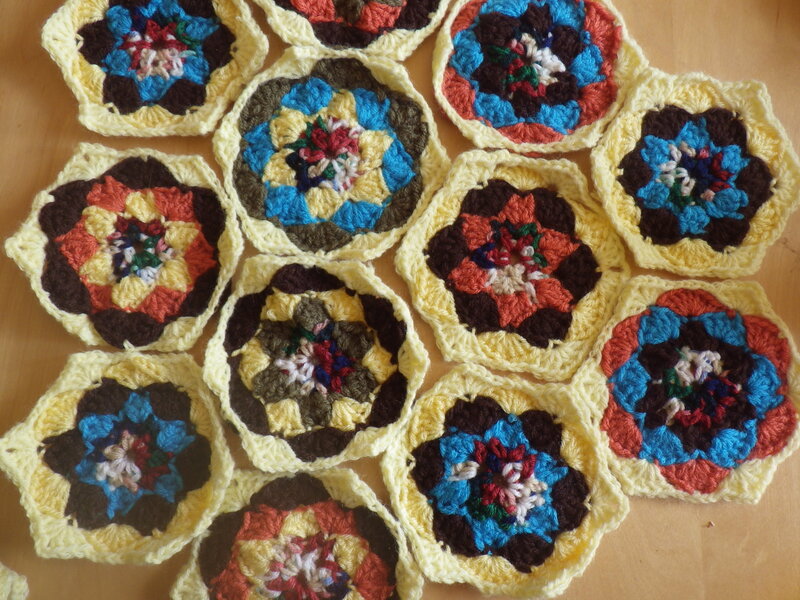 Did I mention that last week Katy the Night Owl donated a bag of crochet hexagons to our charity blanket project? She decided that she was never going to make anything from them, so passed them on to me to use. Today I took them to our latest cake and craft afternoon to see if I could get someone to turn them into a lap blanket. Sadly I wasn’t at my most persuasive, but I did get a couple of offers to stitch them together once they were edged, so I spent the afternoon and part of this evening edging them with white yarn donated by my mum. Once they have been sewn together, I’ll do an outer edge round them in a contrasting colour and we should have a completed blanket… all from unwanted things.